Content by Tony Macklin. Originally published on July 17, 2018 @ tonymacklin.net. Leave No Trace is a paean to empathy. As such, it's counter to a prevailing attitude in America that thinks empathy is stupid and/or unlawful. But empathy transcends law. Sometimes the world is decent, human and spiritual. The authorities in Leave No Trace often try to show empathy, but the law and rules often thwart it. It's up to the people to protect and promote it. In Leave No Trace, most of them do. Leave No Trace is the story of a father and his teenage daughter who live off the grid in monumental woods in Oregon, where they take unending pains to hide from the encroachments of civilization. Will (Ben Foster) suffers from post-traumatic stress disorder from his past experience in the desert wars, and he and his daughter Tom (Thomasin Mckenzie) avoid contact with the outside world. They depend totally on each other. Will is a nonconformist unwilling - or unable - to adapt to society. He abhors "rules" and "things." When Will and Tom are in the confines of civilization, he puts a television set in the closet. He has no phone. He finds himself in a world of objects - material and digital - generic forms, machines, and artificial intelligence. He asks his daughter, "Is it a want or a need?" This is his existential question. He needs to flee. Leave No Trace is a title with different reverberations. One is the traditional ethics of leaving nature unsullied as humans trek through it. Another is that there is no trace of the victims of PTSD. They simply disappear. 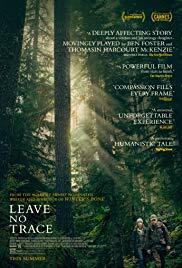 Leave No Trace is an adaptation of Peter Rock's novel My Abandonment, which itself was based on the experience of an actual father and daughter, who lived in Portland, Oregon's Forest Park. The screenplay was written by director Debra Granik and co-writer Anne Rosellini, who combined to create Winter's Bone (2010). The writers depart from the novel in the second half and reach a significantly different conclusion. Granik is a director with a potent visual style. Cinematographer Michael McDonough - who also worked on Winter's Bone - is crucial in helping her to achieve it. Obviously, one of the film's major symbols is the natural world of the forest - a sprawling vision of green. Granik and McDonough capture the formidable vitality of nature in Oregon and beyond. A more subtle symbol is the constant emphasis on hands. The film is replete with images of hands. They work; they give intimacy. There are luminous shots of hands picking at green shoots, a hand holding a knife whittling branches at night, hands during the day cutting mushrooms for food, hands holding up containers of water that spills into mouths, and hands peeling an orange. There are hands holding bunnies. And there are gloved hands over a bee hive, and then ungloved hands with bees on them. There are hands touching and saving. Tom's hand seeks a pulse as Will lies still by a rushing, gurgling body of water. And there are hands communicating. Will and Tom hold hands in a car. There are Will's hands around Tom's neck, and hers around his. Father and daughter. It's a world of hands. And the meaning in them. Although Granik creates a view of reality, she avoids the more harrowing and upsetting. Granik makes a smart commercial choice in softening her approach. She doesn't use flashbacks to the horrors of war. They're unnecessary. Will is severely psychologically wounded, but Granik doesn't make it explicit. The psychological wounding, though inexplicit, is powerful. There are plentiful signs of shadows and dread in Will's mind. Will's reaction to the sounds of a helicopter is sufficient. Although Granik creates a convincing view of reality, she avoids violence. Not a single animal dies. Faithful dogs live; bunnies live. Leave No Trace has a scene of bunnies being handled by youths at a 4H meeting. One may be fearful, but it shows bunnies at their most adorable. If you love bunnies, Leave No Trace is for you. There is little physical conflict in Leave No Trace. There's no physical fighting. Only nature and a homeless camp are victims of physical violence. Granik has a poignant sense of irony. The caseworker (Dana Millican) says to Will, "It's important for you to follow through [the rules], so you guys can remain independent." Will and Tom are cast out of "public land." Will works on a Christmas tree farm, where they cut down trees and bundle them to be sent to California. He damages his own would-be refuge. But materialism dominates. Will wants to work at the stables, but the owner of the farm tells him to work with the trees. He says, "That's the way I make my money." Granik has a wonderful gift of working with actors. Ben Foster, as Will, has the ability to create a character of unspoken thoughts, not just gestures. But the film's treasure is the New Zealand actress Thomasin McKenzie, who portrays Tom. McKenzie is a fresh, natural talent, who is nearly perfect. Granik set Jennifer Lawrence on her pathway to stardom in Winter's Bone. She may well have set McKenzie on the same pathway with Leave No Trace. The performances give the film a resonance of reality. As do the sequences of actuality - such as the 4H gathering, devotional dancing and Christmas tree farming. Occasionally, Granik goes over the top. There's a pretentious shot of a huge tree separating Tom and the caseworker. And Will and his daughter play chess in the forest. Yes, they play chess. Pawn to Cliché 5. But basically Leave No Trace is rooted in the real world. And it doesn't shirk the sufferers of PTSD. The real world needs it.